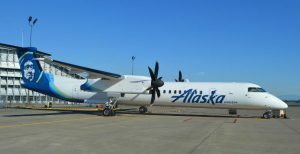 On Friday night around 8pm a Horizon Air worker took a Bombardier Dash 8 -Q400 turboprop and flew out of Seattle-Tacoma International Airport, crashing into an island in the south Puget Sound about 90 minutes later. Officials said no other passengers or crew were on board and military jets had been scrambled to fly alongside the plane. The man who took a Horizon Air turboprop plane from Sea-Tac International Airport and crashed it on Ketron Island Friday night was Richard Russell, a 29-year-old ground-service agent well liked by coworkers. Russell took off from Sea-Tac around 8 p.m. and flew above Puget Sound for about 90 minutes, doing aerial stunts and being trailed by two F-15C fighter jets before crashing. A 3.5-year employee of Horizon, Russell was born in Key West, Fla., and moved to Alaska at age 7. He lived in Coos Bay, Ore., before moving to Sumner, Pierce Co., in 2015. He did not have a pilot’s license. The FBI is leading the investigation into the incident, working with the National Transportation Safety Board, the Federal Aviation Administration and other agencies. It is believed no one was injured on Ketron Island, a sparsely populated island near Steilacoom, Pierce Co.